Release date: August 21, 1995. The 20th anniversary of the band. Recorded in 1994 at Suma, Paul Hamann engineering. Robert Wheeler and Scott Benedict. In the beginning (circa 1975) there was Pere Ubu, and, apparently, in the end there will be Pere Ubu. 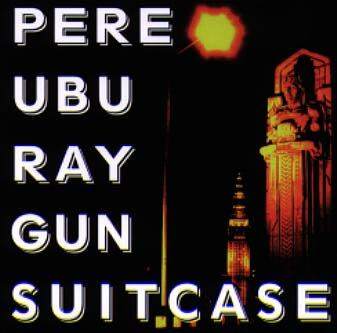 RAY GUN SUITCASE is something like Pere Ubu's fourth farewell album in the last two decades. It seems to be their niche: to always be coming, to always be going. Chances are that they will still be coming and going long after other artists have been forgotten by a trend-hopping public. Pere Ubu's dizzy, contrary sound has consistantly broadened out into new directions over the last twenty years without losing any of its original appeal. Pere Ubu are truly a ground-breaking act that have been a huge influence on the way countless bands approach music. They have also have transcended and/or sidestepped trends and popular culture alike. Ubu music exists in Ubu space, a sort of musical parallel universe where anything can happen. When Pere Ubu first rose up out of the fertile Cleveland scene in 1975, no one had heard anything like them. The slanted rhythms, herky-jerky keyboards, raspy guitar and unbelievably tense, strangulated vocals were a total anomaly to both the nascent punk rock scene and the vast, banal wasteland of mass appeal pop and rock music. Through classic albums like DUB HOUSING and THE MODERN DANCE, Pere Ubu honed their perspective into a fully realized musical persona; intelligent, cryptic, surreal and blackly comic, all with a healthy dose of knowing. For RAY GUN SUITCASE, Pere Ubu's first album in almost three years, vocalist and founding member David Thomas is joined by guitar player Jim Jones, who has been with the band since 1987; and relative newcomers Michele Temple, bass; Robert Wheeler on EML synthesizers and theremin; and drummer Scott Benedict. All are Clevelander's, and all are veterans of bands like The Vivians, The Easter Monkeys, Home & Garden, Mirrors, and The Electric Eels. Original Pere Ubu drummer Scott Krauss and cellist Garo Yellin are also featured. Tim/Kerr Records and Cooking Vinyl are delighted to present the latest -- but not last-- work from a group of true American originals. David Thomas <pereubu@projex.demon.co.uk> started Pere Ubu in August 1975. Clevelander. Singer in Ubu. Jim Jones <ubutique@aol.com> joined Pere Ubu in 1987. In the 70s he played with The Mirrors, The Electric Eels, The Poli-Styrene Jass Band and Foreign Bodies. He was asked to join the tour party for the first Pere Ubu US & European tours in 1978. In the 80s he recorded with The Easter Monkeys, Home & Garden and David Thomas. Clevelander. Guitar player in Ubu. Michele Temple joined Pere Ubu in April 1993. She was a member of Scott Krauss' Home & Garden in the 80s and plays guitar in her own band, The Vivians. Her main instrument is lute. So she divides her time between the thrash metal Vivians, a medieval consort group and Pere Ubu. The Vivians album is produced by Jim Jones. Clevelander. Bass player in Ubu. Robert Wheeler <rwheeler@clovs8.clo.dec.com> joined Pere Ubu in July 1994. He was a member of Scott Krauss' Home & Garden in the 80s. He is president of the Edison Birthplace Association. He farms and repairs mainframes. A protege of Allen Ravenstine. Childhood friend of David's brother. Clevelander. Plays EML synthesizers, the theremin & things in Ubu. Scott Benedict played drums on the album but didn't join the band. He played in The Vivians. He retired from music. Clevelander. Scott Krauss joined Pere Ubu in August 1975. Plays on four songs. Clevelander. Was the drummer in various earlier versions of Ubu. Garo Yellin played electric cello in Pere Ubu from April 1993 to June 1994. Plays on four songs. He was a member of The Ordinaires and pursues a career in classical music in New York City.